In today’s digital world, HDMI splitters are the key to a comfortable life. From satellite boxes to televisions, HDMI splitters are used to distribute digital signage content from one input to multiple outputs. It is responsible for transmitting flawless digital audio and video signals without signal loss. Be it any media setup, these splitters are necessary to ensure perfect picture and sound quality. 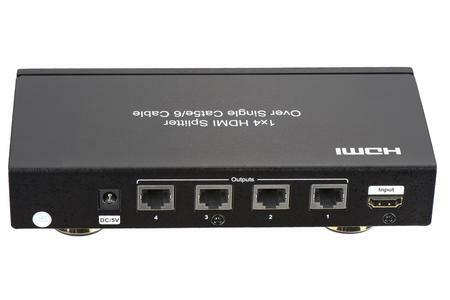 An HDMI splitter is a device used to split a High Definition Multimedia Interface (HDMI) signal into multiple signals to be displayed on various screens. For example, an HDMI splitter takes audio and video content from a DVD player, cable box or satellite box and displays identical content on multiple computer screens or televisions. This device works best for home offices, conference rooms, business centres and classrooms. Many people confuse it with an HDMI switch which is used to connect multiple HDMI source devices to a single television or computer screen. HDMI splitters are available in several varieties such as 1X2, 1X4, and matrix combinations such as 2X2, 2X8 and 4X4. The most common type of splitter used is 1X2, used to split signals from one source to two display devices. For example, if you have two televisions in your home in two different rooms, then a 1X2 splitter can do the work for your by splitting the signal into two screens. Most of the splitters used nowadays support HDMI version 1.4A specifications. They can support resolutions of 480p, 720p, 1080i and 1080p. If you’re using high-quality HDMI cables, then splitters can be used up to 50 feet from the splitter location to the television. In the absence of high-quality HDMI cables a maximum distance of 25 feet is recommended for transmitting signals without loss. It saves a lot of space as it has a sleek design and you don’t have to install a separate cable or satellite box for second screen or TV. No signal is lost while splitting and high-quality audio and video signals are received. It is easy to install as you don’t need an additional software program or gear. You can simply connect it to the source device using an HDMI cable. It is compatible with most source and display devices. It is available in matrix combinations to support a large volume of outputs. It drops the split resolution if the display devices have different resolutions. It doesn’t work well with signal converters such as HDMI to VGA. It doesn’t support Audio Return Channel (ARC) and HDMI over Ethernet (HEC). HDMI splitters are the perfect device to view high-quality audio-visual images on multiple screens with no signal loss. It not only offers excellent picture and sound quality but also saves a lot of space. It has some drawbacks, but the positives are so good that this amazing device can’t be ignored. If you want to buy the latest HDMI splitters, then click here.